NYC, 02/08/2019, 4:30PM. 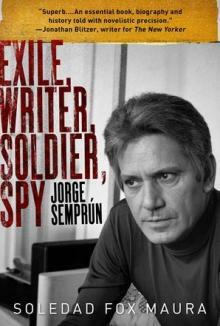 Exile, Writer, Soldier, Spy: Jorge Semprún. Exile, Writer, Soldier, Spy (Arcade 2018) is the first biography of Jorge Semprún, and explores the incredible life of a European hero who was an exile, French resistance fighter, Nazi camp survivor, novelist, political activist and Oscar-nominated screenwriter. Author Soledad Fox Maura is a Professor of Spanish and Comparative Literature at Williams College. She has a BA from Sarah Lawrence College and a PhD in Comparative Literature from the Graduate Center of the City University of New York. She is the author of three books. Her work focuses on biography, and on the the intersections between literature, memoir, and history in the contexts of the Spanish Civil War, World War II, and the Cold War.